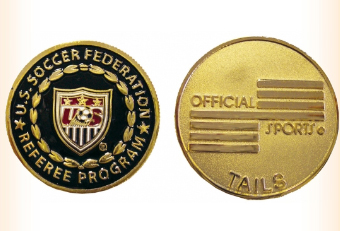 OFFICIAL SPORTS in conjunction with US Soccer has developed the Foundation Flip Coin. This historic referee logo is displayed in full color on the front of the coin, while the back shows the OSI logo is brushed in gold. The collector's piece measures 1-3/8" in diameter and supports the work of the US Soccer Foundation. The back of this coin can be customized with your state logo when purchased in volume - call for details.